Gather ’round, ladies and gents, and let first-time director Michael Gracey regale you with the tale of Phineas Taylor Barnum (as played by Hugh Jackman), a great man who nearly a century and a half ago followed his dreams and made his fortune founding a circus that served as entertainment for patrons and as a home for its performers: The freaks, the weirdos, the outcasts, the downcast, the discarded, all of them together a scintillating rainbow of diversity, glimmering in celebration of humanity’s beautiful differences. That’s the yarn The Greatest Showman wants to sell you, and oh, the hoops it jumps through for enterprise’s sake. Gracey has made an ingenious fiction spun from history, a movie that delights with spectacle as much as it repels with revisionism. Part of you will enjoy it. Another part of you will hate the part of you that enjoys it. Maybe there’s a pretentious meta-reading in there somewhere, because as surely as Barnum’s crowds felt disgust at his circus acts, they also felt compelling wonderment over the unique curiosities on display at each show. Frankly, there’s no reason to feel bad should you end up under The Greatest Showman’s spell—that’s what it’s designed to do—but hang onto your sense of perspective. The whole damn movie is a passionate lie. The Greatest Showman plays up and waters down Barnum’s narrative to position him as a social reject in his own right, determined to support his wife Charity (Michelle Williams) and their two daughters to such an extent that they want for nothing. He’s a blustering charmer, a man quick with words and hip to what audiences really want when they want to be amused. He also has a big heart, apparently, so as he goes about assembling his motley crew, made up of bearded ladies (Keala Settle), dwarves (Sam Humphrey), tattooed men (Shannon Holtzapffel), acrobats (Yahya Abdul-Mateen II) and trapeze artists (Zendaya), he unwittingly assembles an ersatz family for himself, for his stars and for his co-partner in petty hucksterism, Phillip (Zac Efron). That summary packs enough treacly schmaltz to send the average moviegoer into a sugar coma, or it would if the film’s musical numbers weren’t so rousing. Praise for The Greatest Showman’s score and choreography is praise given grudgingly indeed: A film that’s this much of a mess shouldn’t also be so bloody effective at giving its viewers goosebumps. Credit where due, then, to Justin Paul and Benj Pasek, who wrote the soundtrack, and to The Greatest Showman’s cast members, who throw all of their being into each song with striking zeal. They care about what they’re doing, because every time the songs kick in, you start to care, too, after spending minutes decidedly not caring about Gracey’s over-hurried CliffsNotes take on Barnum’s life. The Greatest Showman is built around Barnum’s origin story (it’s Barnum Begins, if you will), with each chapter rushed to the point of self-satire. Naked hagiography galls enough, but the pace Gracey sets for the film is disorienting. One minute Jackman is mooning over the hopes and dreams of his family’s comfort and security, the next he’s roping together a handful of people the culture deems abnormal, shoving them onto a stage, pulling in ticket buyers in droves. Then the circus is protested. Then the circus is even more successful than before, and Barnum is going on the road with Jenny Lind (Rebecca Ferguson), a Swedish singer whose voice he uses to line his pockets. Somewhere in the midst of this whirlwind, the circus performers meet the Queen of England. Lind tries to seduce Barnum. The circus burns down. The show goes on. Imagine that The Greatest Showman is a novel and that Gracey is a speed reader, and you’ll have an idea of what it’s like watching it as a movie. By the time the credits roll, about half an hour earlier than expected, you’ll wonder where the rest of the footage went. As year-end bio dramas go, The Greatest Showman is remarkably, almost mercifully, short, though that shortness is both a blessing and a shortcoming: You won’t be sad to be done with the movie, but you’ll probably wish for Jackman to lead the cast in one more song. Jackman doesn’t need to show off his entertainer credentials, but every once in awhile, when he isn’t busy stabbing bad guys with retractable claws, it’s nice to be reminded that he’s a hell of a master of ceremonies. The camera loves him, for all that matters. The camera could loathe him and he’d still command its eye with dazzling, earnest energy. The camera loves his co-stars, too, especially Zendaya, who in 2017 has made a routine of being just about the best thing in her big-screen appearances. Like Jackman, she has a great talent for guiding the camera, and like Jackman she’s almost obnoxiously gifted in multiple performing arts. 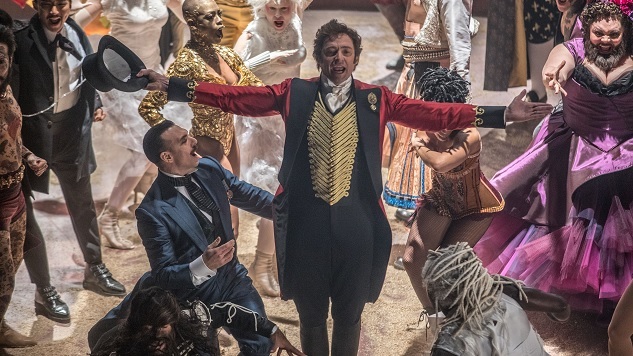 Buttressed by the rest of the film’s troupe, it’s little surprise that The Greatest Showman should work so well in its musical mode, but that only makes the decision to base this movie around Barnum all the more puzzling. An extravagant, joyful, inclusive and original musical sounds like the perfect capper we need to offset this godawful year. We get bits and pieces of that musical, but coupled with a whitewash of a troubling figure known for exploiting people, quite literally all kinds of people, particularly disabled people and black people. The results feel like a kick to the groin, though, as small consolation, that kick is probably unintended. Gracey wants us to see The Greatest Showman for the show. That’s certainly possible. It’s equally as impossible to watch the film without feeling uncomfortable knowing what he’s left out of the picture. Boston-based pop culture critic Andy Crump has been writing about film and television online since 2009, and has been contributing to Paste since 2013. He also writes words for The Playlist, WBUR’s The ARTery, Slant Magazine, The Hollywood Reporter, Polygon, Thrillist, and Birth. Movies. Death., and is a member of the Online Film Critics Society and the Boston Online Film Critics Association. You can follow him on Twitter and find his collected writing at his personal blog. He is composed of roughly 65% craft beer.